The Laboratory for Biosynthetic Studies has turned its focus in deconstructive biosynthesis efforts into two classes of potent bioactive molecules that should be important life-saving drugs, but are not, the everninomicins and apoptolidins. The Laboratory for Biosynthetic Studies has turned its focus in deconstructive biosynthesis efforts into two classes of potent bioactive molecules that should be important life-saving drugs, but are not, the everninomicins and apoptolidins. Via understanding how these molecules are put together by the bacteria that make them, we will learn how to generate changes in their molecular structures by recoding the producing organisms at the genetic level, to make them better drugs and/or effective molecular probes for biological studies. It is now widely appreciated that we are entering into a post-antibiotic era. Resistance of killer microbes has reached crisis levels, and it is now possible to die from an infected splinter. The everninomicins are a class of natural product antibiotics that have been shown to be effective at killing multiple drug resistant bacterial infections in humans. The biological target of these drugs is unique from known classes of antibiotics and for this reason it is expected that evolution of resistance to these compounds will be slower than to derivatives of existing classes of drugs (e.g. a derivative penicillin). Everninomicin A, also called Ziracin, was advanced into clinical trials and proceeded successfully into late stage III trials. Tragically, Ziracin failed at the end of Phase III where it was discovered that this compound had borderline toxicity in sick patients. 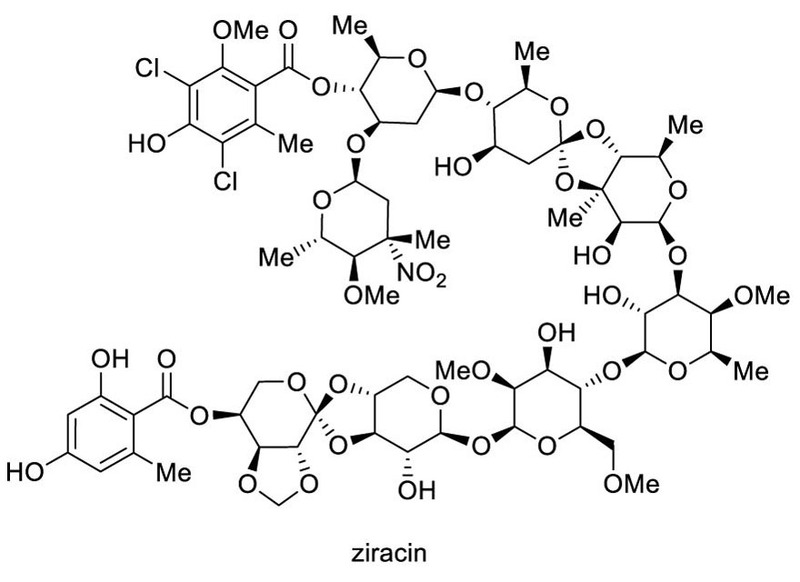 Ziracin is a complex and large molecule by antibiotic standards, and this toxicity is likely due to a substructure in this giant molecule. We hypothesize that if the disadvantageous substructure could be changed, we could eliminate the borderline toxicity of this compound and correct its trajectory toward the clinic, where it is so desperately needed. Due to its high promise as an antibiotic, Ziracin has actually been chemically synthesized and it required 140 chemical steps to generate Ziracin. Hence, it is impractical to use chemical synthesis to generate Ziracin analogs to overcome the toxicity of this compound. We have undertaken an ambitious program to change the structure of Ziracin-like compounds using synthetic biology. We have identified the genetic blueprints for Ziracin biosynthesis, and are using unique gene-replacement technologies, developed in the LBS specifically for this organism, to study the biosynthesis of this exiting antibiotic lead compound and to modify its structure. 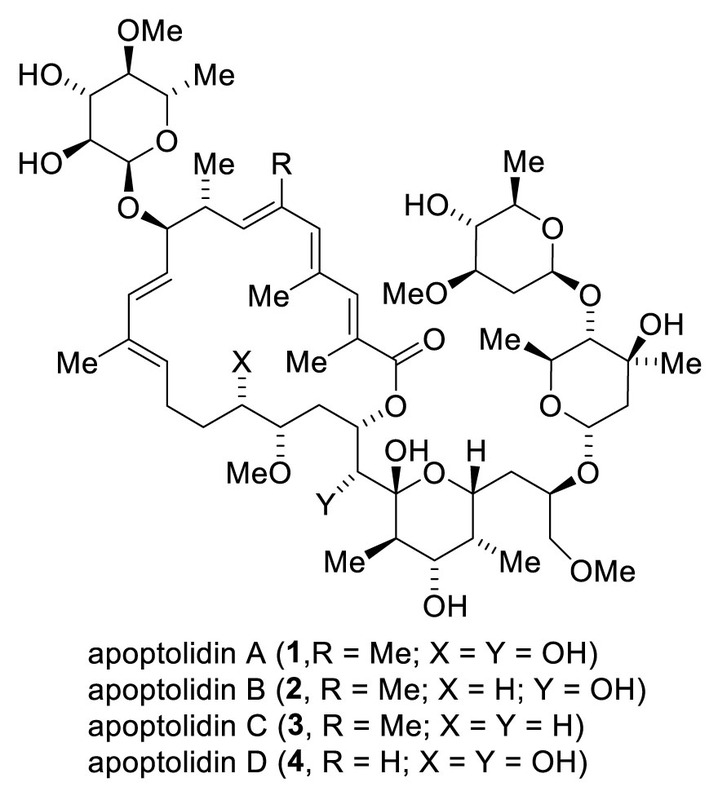 Apoptolidin natural products are a class of potential anticancer compounds that have been reported to be some of the most selectively cytotoxic compounds in the National Cancer Institute’s cell panel. This means that these compounds can potentially act as cellular scalpels, and selectively kill cancer cells within healthy tissues. However, nothing is known about the biosynthesis of these compounds and their mechanism of selective action. We have identified the genetic blueprints of the exciting class and used gene replacement technologies to study the genes and proteins involved in the assembly of apoptolidins. Building on this knowledge, in collaboration with Prof. Gary Sulikowksi, we have generated completely new unnatural analogs of apoptolidin. We envision using these new analogs as chemical probes to discover the cellular target of this exquisitely cytotoxic family of metabolites.